Wastewater pump stations face an influx of sewer clogging rags and debris, so JWC Environmental engineers developed the breakthrough vertical Auger Monster® screening system to fit inside cramped pump stations and provide complete pump protection. Once installed, Auger Monster model AGV safely and easily screens, cleans and conveys rags and debris straight up and out of the sewer system. This gives collection system managers an affordable new way to remove rags before they clog sewage pumps, eliminating the time and expense wasted on de-ragging pumps. The vertical Auger Monster is attached to the wall of the pump station next to the inlet pipeline and captures rags, wipes, plastics and trash before they get inside the pump station. Auger Monsters are custom built for each site and can screen up to 1 million gallons per day (158 m3/h). It can also be installed as a headworks screen for a package treatment plant or lagoon system. "The 90° Auger Monster opens up a whole new series of applications," said Rob Sabol, Director of R&D. "It fits into a tight footprint to provide complete pump protection by capturing, cleaning and removing rags and trash." A high-capture rate screening basket with ¼" (6mm) circular openings stops the debris, even small trash such as cigarette butts, then the rotating auger lifts it to ground level. The patented compaction zone compresses and dewaters material before depositing it into a plastic bag or bin ready for landfill disposal. 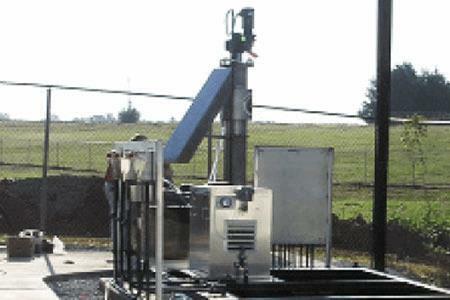 The vertical Auger Monster offers these unique features: a Muffin Monster® grinder shreds material so it is easier to wash, convey and compact; the spray wash system liquifies soft organics putting it back into the wastewater flow; and a compaction zone reduces the volume of material so fewer trips to the landfill are needed. "The terrible problem with 'flushable' wipes in the sewer system requires creative and affordable solutions," said Scott Kelly, Vice President of Sales and Marketing. "The vertical Auger Monster is a solution collection system managers will like — it's affordable, automatic and makes pump stations reliable once again." Our new vertical screen joins a complete family of Auger Monster screening systems. The AGV screens at 90° while models ACE, AGE and ALE are installed at 35° or 45° for higher flow screening. The Auger Monster is popular because it incorporates an entire headworks system into one single package — a rugged Muffin Monster® or Macho Monster grinder, screen, washer, conveyor and compactor. It's an affordable screening solution for small and medium sized treatment plants with flow rates up to 10 million gallons per day (1,600 m3/h). Auger Monster is also an award winning technology — winning the Water Environment Federation's prestigious Innovative Technology Award in 1997.